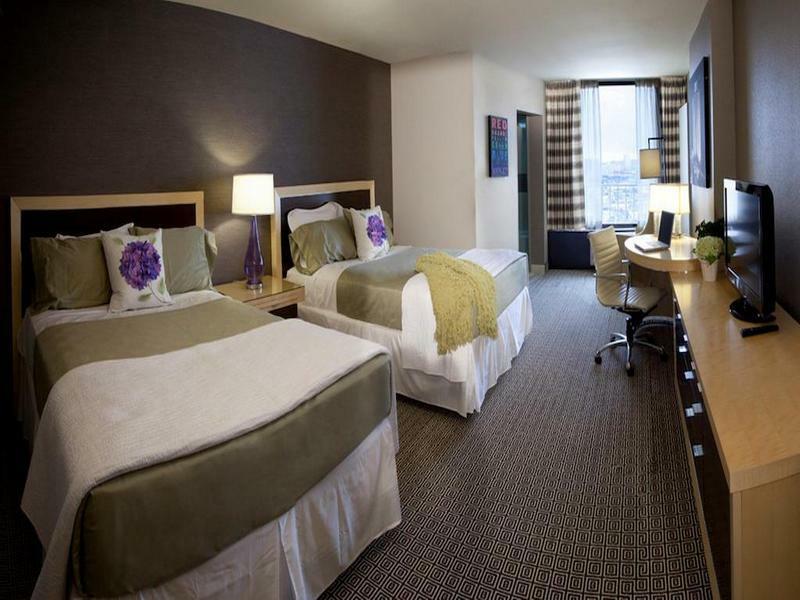 "The plaza was a great hotel at a reasonable price." "This hotel has very good price, good location, good WIFI." "Check in was smooth, room was very nice." 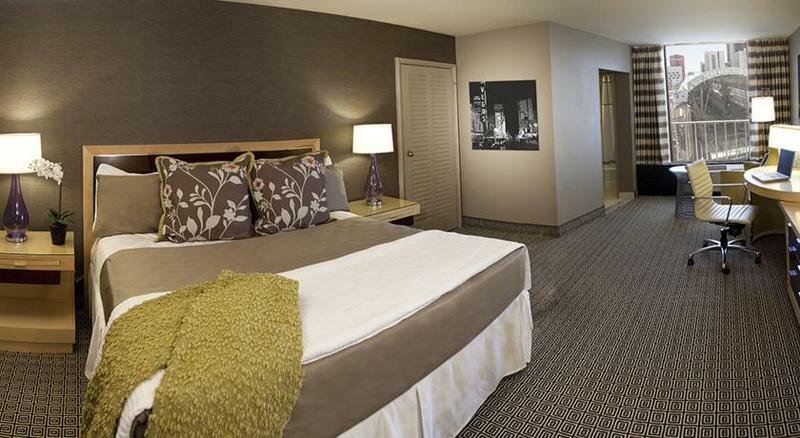 "We stayed at this hotel a couple of times and it was amazing..."
A variety of restaurants are on site for guest convenience at this Las Vegas hotel and casino. Guest rooms offer free Wi-Fi. A flat-screen cable TV is featured in each room at the Plaza Hotel and Casino. The air-conditioned rooms include a work desk and an en suite bathroom with free toiletries. Oscar's Steakhouse, Hash House A Go Go, and Pop Up Pizza are all on site at the Hotel and Casino Plaza. Guests can also take advantage of the food court featuring a variety of fast food options. A seasonal rooftop pool and a fitness centre are both available for guest use. Various shops are on site and dry cleaning services are offered. A unique hair salon featuring female stylists wearing bikinis and lingerie is located on the property. The hotel is 4.5 km from Las Vegas Convention Center, 500 m from Fremont Street Experience and 7.5 km from Thomas & Mack Center. McCarran Airport is 10 km away. The property offers free parking. "Room was clean,comfortable and large." The property provides a drop-off service to the airport. Please note, guests under the age of 21 are only allowed to check in with a parent or official guardian A nightly fee plus a tax resort fee will be charged a check in. The inclusions are as follows: -2 bottles of water in the room daily - Free parking - Coupon book - Daily access to the fitness room - WiFi Additional charges for incidentals may occur at check in. Please contact hotel for details. Only rooms with King size beds allow a rollaway Guests are required to show a photo identification and credit card upon check-in. Please note that all Special Requests are subject to availability and additional charges may apply. A security deposit of USD 50 is required upon arrival for incidentals. This deposit is fully refundable upon check-out and subject to a damage inspection of the accommodation. One of the pioneer hotel in Las Vegas, the room feels like you're in the '70s or '80s but very spacious and clean --good experience :) our room has a big window with a nice view of the Sierra Nevada mountain ranges afar, the hotel is located at end corner of Fremont street where the action begins (near Golden Nugget), varieties of restaurants and casinos are at the ground level, friendly and very helpful staffs, airport transfer is available with VIP treatment. Other minor downsides; no kettle for boiling drinking water in the room, no bidet spray in the toilet. Overall, the hotel is highly recommended. The Plaza was our last check-point of our road trip, travelling from Seattle - SF - Yosemite - Grand Canyon - Vegas before taking a flight out. It was our very first time . Parking is free, check-in at the Plaza was very smooth, staff was very helpful and friendly. The room was clean and big. We had a good night sleep before taking our flight out on the next day. The price was very reasonable. Hope to see you again, The Plaza! 4 of us stayed in a double room. We are only there to basically nap so it was perfect. Just wish the bathroom was bigger. The toilet/shower room is so small. Bathroom in room reeked of cigarette smoke. Had to keep door closed. Still waiting for the emailed receipt for our room of 4 days. Lousy reception service upon check-in (dont remember her name) but check-out (attended by another lady) was fine No kettle if u would like to have some hot water Do note that resort fees of $22 applies. Si vous voulez visiter downtown et profiter de l’ambiance du quartier en soirée cet hôtel est vraiment bien placé ! Il possède un parking. Les chambres sont propres. Il y a une piscine en hauteur pour ceux qui veulent. Rapport qualité/prix convenable en comparant avec d’autres hôtels du coin. So the hotel is across the street from Freemont street where there is a lot to do. Very good location but if they fixed it up would be superb. Firstly the rooms are big but if u looking just to party then stay here but if u looking for good night sleep it's way too noisy as the music from Freemont goes on till 1-2am on weekdays and till 4am on weekends. The noise blasts thru into the room as the windows are outdated. Bathroom tub doesn't drain and gunk comes back up. The aircon is very noisy and doesn't help if you wanna sleep. The food and staff in the hotel were the best part of staying here. Would I stay here again? Not unless they renovate and fix up the rooms. Especially by changing the windows so outside noise doesn't come in. 1) I could have used a mirror in the room area. Women do their makeup. We need lights and mirrors. Doing my makeup was very difficult. 2) A coffee maker and mini fridge. Cheaper hotels provide them. 3) The sink area has terrible lighting and the fan in the bathroom could have a been quieter. Other than that everything went quite well. Beds were very comfy and we had a rather nice view of the other tower and the mountains. Fremont Street was fun! Mainly came to Vegas to see Penn and Teller on Halloween which was a wonderful show. Also enjoyed a bit of the Arts District on a nice walk to a local dispensary before heading to the airport to catch our flight home. These folks rented my room out while I had not checked out. Would not give me the name of the manager. The restaurant Peole ought to be fired .no smile and like they were doing me a favor for being there. Would not stay again. The staff was exceptional at every point, but the facilities/room was aged and pretty junky. Furniture was heavily scratched up. Gross mattress cover on one bed. No mattress cover on the other. Minimal bedding. Room smelled like dirty feet. No glasses in the room; only little plastic cups. Poor quality soap and shampoo. No conditioner. No chain lock or latch on the door. (Any staff can come in while you’re in the room.) No coffee, no mini fridge. Pool closes at six. (Not everyone goes to Vegas to get wasted.) No room service. Restaurants expensive, but good food. But servings are huge, and there’s no way to store or heat leftovers. What’s the point? ( We put half of our food into to-go boxes before even eating it, and were able to give it to hungry/homeless people on Fremont Street. ) I usually only give reviews when I’ve had exceptionally good experiences. Had to throw this one into the mix, because I did spend a lot of time choosing this hotel, and was very disappointed. it was good compare price!! good! 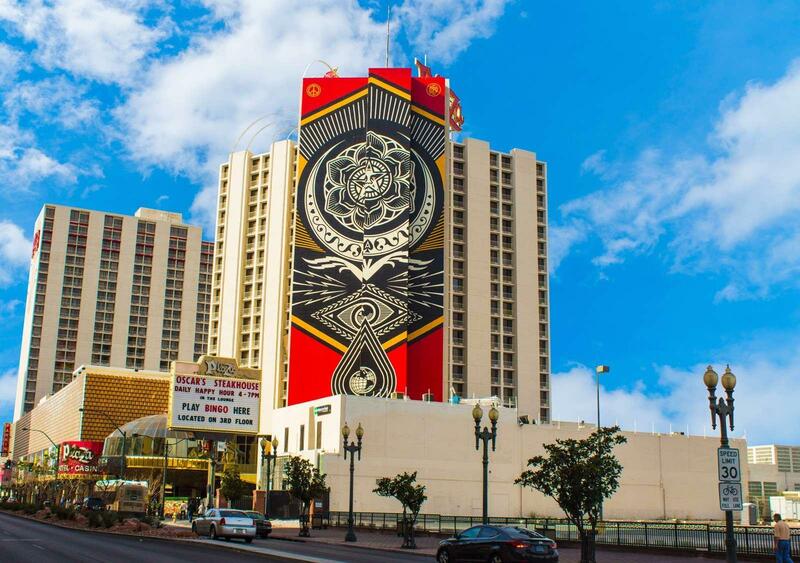 It's located in downtown in Las Vegas. Its a good enough place to stay for rest, decent rooms. Overall its a dated facility. very bad doesnot like at all.. tv no signal was not working.. very small bathroom.. only 2 light bulb in the room .. no more lights so it was not dark but not lightfull also.. except the view everything is bad.. The casino had a really weird smell to it. We arrived on Friday to our hotel and the toilet did not flush. When we tried to telephone room service, the telephone didn't work; we had to walk down to the reception which was quite inconvenience. On Saturday, my group and I went to the Grand Canyon and we returned by 9pm and the guest parking lot/ramp was already full.